The Notary Chamber of Georgia was established on May 3, 1996 under the Georgian Law ,,On Notary”, defining the legal basis for arranging the notary and notary’s activities in Georgia. Notary Chamber of Georgia is the union of notaries based on their compulsory membership and principles of self-governing. According to the Georgian Law, the Notary Chamber is a legal entity of public law, which isn't financed from the state budget. Each member of chamber is obliged to pay membership dues. The supreme managing body of the Georgian notary is the General Meeting of Members of the Chamber, while executive body is the Board, consisting of 7 members, being elected by the Meeting for the period of 3 years by secret ballot. Chairman of the Board is also elected by the General Meeting by nomination of the Minister of Justice. The Notary Chamber of Georgia represents and protects the interests of notaries, assists them in performing notary activities, provides their involvement in solving the problems which notariat faces, as well as implementation of general professional interests of notaries. Georgian notary declared its will on joining the International Union of Notaries (UINL) as far back as 1996. On October 2-6, 2007 the General Meeting of UINL held in Madrid, Spain took resolution on affiliation of Georgia in the Union. UINL unanimously recognizes the Notary Chamber of Georgia as the highest representation of the Georgian notary and confers all rights and privileges, being established for the members of this Union. Georgian notary is the plenipotentiary member of the Commission of European Affairs (CAE) of the UINL. Before admitting the Notary Chamber of Georgia to the UINL it had close links with various Commissions. After affiliation the Notary Chamber of Georgia actively participates in relations with the commissions of UINL and plans to hold various conferences on the territory of Georgia. 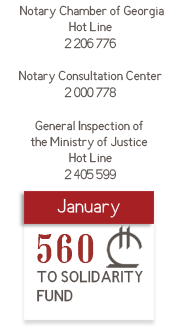 Notary is appointed on the position by the Minister of Justice, who also determines the number of notary positions in Georgia. Under the Decree of the Minister of Justice the maximal number of notaries was determined to be 300. Notary in Georgia is liberal in his (her) professional activity and by means of notary and other associated acts exercises the state authority. Since 1996, under the Georgian Law ,,On notary” the legal status of notary, as of the representative of liberal profession has been determined. Notary is an impartial and trustworthy advisor for its clients. Notary-attested documents have indisputable probative force. Notary’s position may be occupied by a capable Georgian citizen with higher legal education, having passed relevant traineeship or at least one year length of service as a notary or at least 5 years length of service in public bodies, also having successfully passed qualification examination of notaries and won contest according to the Order №3 of the Minister of Justice ,,About the rule of conducting a contest for selection the notary candidates”, approved on January 10, 2012. Notary is appointed to the position by the Minister of Justice. Qualification examinations for notaries are conducted by the LEPL Training Center of the Ministry of Justice, while contests for trainees and their preparation are provided by the Training Center of the Notary Chamber of Georgia. Arranging of meetings on professional-legal matters with various administrative bodies. For the aim of preparing the high-qualified personnel, their professional development, elaboration and perfection of practical skills by them, the Training Center of the Notary Chamber of Georgia provides preparation of trainees. Trainees are selected and admitted on the basis of contest, being conducted in the form of testing in ability. Trainee applicant should be a capable Georgian citizen, with higher legal education. Trainees take theoretical and practical courses during the period of eight months. Theoretical course includes trainings in the legislation associated with notariat and notary activity, acquiring the skills being necessary for acting as notary, while during the practical training they pass practice at notary bureaus, National Agency of Public Registry, State Services Development Agency, National Agency of Enforcement, Service Agency.